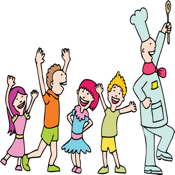 Cooking With Kids Launch Special. 50% Off For The Next 72 Hours!! The essential Cooking With Kids app for 2014! Packed full of great tips and videos for cooking with your kids. Tips and benefits to cooking with kids. Get the Cooking with kids app now while the price is low!